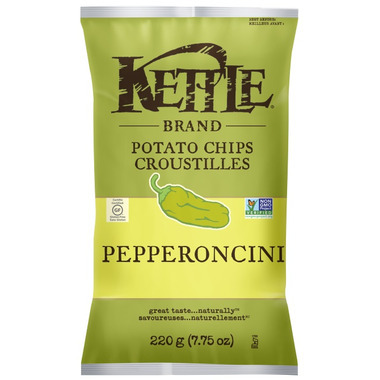 Kettle Brand Pepperoncini Chips have a fresh peppery taste, mild heat and tangy vinegar punch. Pair these crunchy snacks with your favourite hero sub for a match made in heaven…er… an Italian deli. 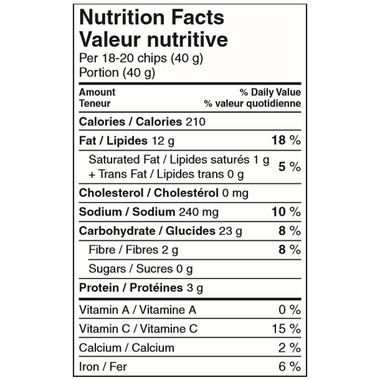 Ingredients: Potatoes, safflower and/or sunflower and/or canola oil, maltodextrin, sea salt, salt, green bell pepper powder, garlic powder, sugar, yeast extract, spices, vinegar, jalapeno powder, onion powder, parsley powder, citric acid, natural flavours, parsley flakes. Used to grow Pepperoncini peppers in my yard because you get all the nice hot pepper flavour without the "blow your head off " heat. My favourite chip flavour by far. Delicious! If you like pepperoncini you will LOVE these chips!